You are here: Virgin Islands News Online » News » Boycott? 8 Members & Speaker snub Governor's swearing in! The prized job in the UK Foreign & Commonwealth Office, which carries more power than the local elected House of Assembly (HoA) as per the 2007 Virgin Islands Constitution, saw the 13th unelected white male being appointed to the post, notwithstanding there are females and blacks in Her Majesty’s Diplomatic Service. However, the story is who were not there. 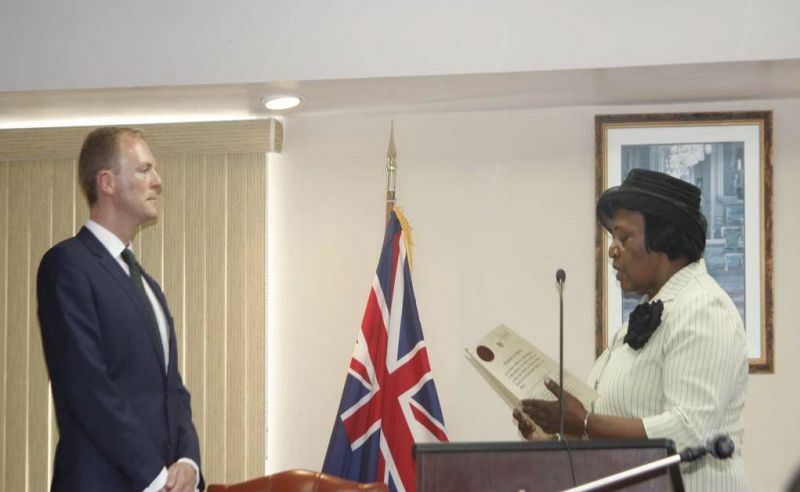 It was Tuesday August 22, 2017 that Augustus J. U. Jaspert aka 'Gus' took the oath of office to be the Governor of the Virgin Islands (VI) amid controversy after being shut out of the HoA, a move spearheaded by Speaker Hon Ingrid A. Moses-Scatliffe. A senior National Democratic Party source, speaking to our newsroom, told us that the other eight members who were a no show wanted to send a message. "Some were on vacation, one even was at Martha's Vineyard, some were overseas on official business while the one or two who were here were not coming anyway." The senior source also told our newsroom there was an informal meeting of the HoA where the matter was raised a few weeks ago of the governor not being invited to be sworn in at the HoA, and from then "it was clear who supported the move." When asked if he can speak for one Opposition Member who was not in attendance at the ceremony, the source responded "I don't usually talk all…"
Elected Members who were not at the High Court in Road Town, the capital city, for the August 22, 2017 swearing in of Mr Jaspert, were Hons Ronnie W. Skelton (AL), Myron V. Walwyn (AL), Archibald C. Christian (AL), Marlon A. Penn (R8), Delores Christopher (R5), Julian Fraser (R3), Alvera Maduro-Caines (R6), and Melvin M. Turnbull (R2). Also not showing up at the ceremony were Speaker of the HoA Hon Ingrid A. Moses-Scatliffe and Attorney General Baba Aziz. The other five members of the HoA made the ceremony, along with an Acting Attorney General, and Deputy Governor Rosalie Adams, who has been an advocate for the status quo. One time it was reported that Mrs Adams walked out of a ceremony when the British National Anthem was not sung at the beginning of the event. Meanwhile, no officials from the United States Virgin Islands (USVI) or other regional governments or diplomats were invited to the ceremony. A government spokeswoman, Ms Desiree Smith, told our newsroom "it is not customary to invite officials form the USVI to the swearing in of the Governor." She declined to comment further. 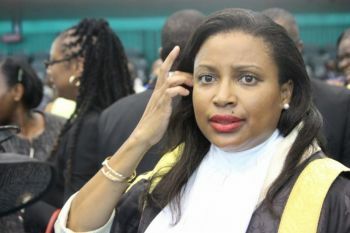 It is our understanding that the stand taken by some who did not attend the ceremony was to send a message that the VI should be thinking about independence and not holding on to vestiges of the colonial past, where an unelected civil servant in the post of Governor has more power that an elected government. It is unclear if there will be fallouts over the matter as Governor Jaspert has already sent a message that he will not be afraid to act if the local elected Representatives are "not practicing good governance". Some organized a good excuse by booking their vacation around the same time. Others just couldn't be bothered. All in all this is disrespectful and our youth should take note of the kind of disrespectful leaders that we have running our country. Whats the big deal with them not showing up? Is it a law that they must be there? Most of those people booked their vacation from the year before. Should they have lost money paid for cruises etc to watch a governor get sworn in? The DG knows the house is normally in prorogue around that time so why did she scheduled it then? It is a know fact most of these officials take vacation around that time..There are soo many more things to worry about in this country and you all here making a big fuss about a governor getting sworn in and who was there and who was absent...strupsss..give me a break man!! You sound like one who would say "Yes Masa" Those days long gone my friend. You and others who here talking piss need to get a shovel and barrow and help clean up your country. I am surprised the elected officials have money left in their pockets to go on vacation after giving most of it away to some of you all on here chatting bull. Like you all saying these people should have cancelled their paid vacation to attending this event..news flash, it aint that serious. If it was so important to you all, then you all should have attended. As an individual I take my family vacation in August; however, I do not wait until August to book a vacation. Are we saying that persons should have scheduled their family vacation around the Governor's swearing in. Or are we saying those who were on island should of attended? Many in this territory do not have and understanding of how kingdom principles work. Those who are the leaders who should have such understanding act like they don't exists on one occasion and on other occasions appeal to them. So which is it is the B.V.I under British rule or not. The ndp has decided to fight the British at all cost no matter how it looks or affects we the people. They are educated but lack any form of common sense and respect. Except when the officials of the NDP want some $'s to help after the storm!!! If they had not spent so much on helping a failed airline and plans for an airport not to be built soon, they could have fix us up ourselves. We don't want any money from the British. We are a proud people. We are not beggars begging from crumbs from the British Table. We always cleaned up after storms. Do you know what it feels like for someone to do something for you and then "throw it in your face" as we say in local parlance? A true Virgin Islander will crawl first before we beg for someone to throw it in our faces. No to the British, we don't need their help to clean up after no storm. We will fend for ourselves. Get off the topic about begging. We don't like to beg, period. That's why you don't catch Virgin Islanders begging for a top-up on their phones. It is against cultural ethics to be begging. We are not beggars? WOW! Go ahead and bite the hand that feed you, and see the outcome. Feed us? Who feeds us but ourselves? Perhaps u are being fed and cannot comprehend any other way but the BVI feeds itself and half of the upper Caribbean people. This was is and has always been. Virgin Islanders most certainly beg! They beg the government for everything and act like they are entitled to receive it. They don't have a job -they want the government to create and give them one. They cannot pay their bills - they ask their district Rep. They need their driveway paved - they ask the government. I could go on. Maybe you don't consider this begging because they are too entitled to beg. Okay, I get it, they demand! This is like saying that when you make a request from your bank for a withdrawal from your funds , you are a beggar. Moneys in the treasury of the BVI belongs to the people of the BVI. None of it was placed there by the UK. @Nobegging....Really? We are NOT begging! The UK owe us since they own these islands. We deserve every bit of help we can get, since these islands were built off of our Ancestors backs. I say if the UK is the mother country, she should send help to her children who are suffering. We are not begging...we deserve HELP!!!! The infrastructure is in such bad shape we can get killed every day that we venture out. Tourism will not flourish if our roads are too scary to drive on. Tourism is a large piece of our income and we need help to get back up on our feet. Some of the responses on here are amazing. It's not a question of begging or being owed. Help was offered from an invested and available party whose main role in being in the Caribbean is support and disaster recovery, it's what they train for. It should have been accepted in the spirit it was offered. It is nearly three weeks on from the storm and although the territory is working it is no where near fully recovered or prepared for any future adverse weather. Is it pride which turned down the offer of help or something more sinister such as those making the decisions being invested in the companies clearing up? Either way, progress is too slow. Don't use that psychology on us! If we need the help we accept graciously and we all know we would have been much further along on the road to recovery had we accepted the help. We have been fooled enough for you to try to pull the wool over our eyes with the "we are proud people" statement. Yes we are proud but we also know when to ask for help. I wonder what happened to our disaster funds? My understanding is that they secretly dipped into that for other things and don't want the UK to know that's why they didn't accept the help from the ship. They don't want the UK to be too involved to start investigating. School children say. When these mafias comeback from their expensive vacations and start to give their excuses all of us will forget their disrespect and forgive them as usual...Oh and the white envelopes does help to bring on our forgetfulness. The NDP and Speaker fighting so the Governor could stay out of the House of Assembly to swear in but can't fight to get back our $7.2 mill from BVI Airways. I guess it's hard to get back from oneself. We know that bald head, the woman that throw out "Gus", and the PM for the wall all on a cruise together enjoying the takes thus far for the year. OMG. How stupid, unprofessional and unpatriotic. SMFH. England is not ready for ahyo yet. when they ready we all will know, trust me on that. mentality in full bloom. Lord, help my people grow. @ belonged: factual statement but the only thing england want with BVI it's is financial service(we to small to be deal with so much money) ask the one fellow from BBC he almost catch a cow over our hospital.....don't you find it strange the rather sudden interest in this little plot of land? Parents you need not to worry, as they want Social Studies to be taught through real events! Oh and don't forget our Ministers are the leaders of this Territory! I am going to make them super proud! After all we are going to create a society that behaves like them! Ps... that's why we are in so much trouble if we put the likes of these people back in! Speaker of the House, you're a disgrace! H*bert you're a big disappointment! There was a reason why we never wanted you in! Gave you a chance and look at the let down! Wow! These people are mindless and spineless! He bring any big children here to go deal with them? He better go check Tobbias and Sanbalath from writing your piss but he going deal with them. Why all you always praising the British? Go UK and see what's going on. Leave our people alone. disrespectful and a clear display of ignorance . What are you afraid of ? Your own corruption ?? Most times the media magnifies things but something not right with this one. ???????? And more ?????????. Pettie issues ????????. Message is not clear and make it worse there were children for the first time. Mark you this generation is not foolish. I think we must not be selfish in our dealings we do more damage than good. 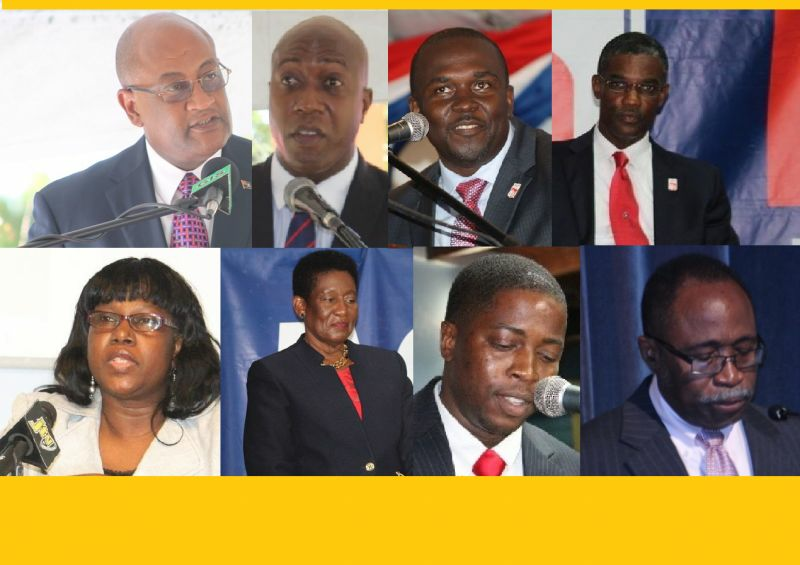 Theses people represent the BVI.. This is embarrassing for the people of the BVI.. Our leaders brings us low..
And who will have the final say? The people of the Virgin Islands will. After all, we will decide our fate. Those who here thinking the British is our saviour, wait until they start to thief your children's inheritance. Go learn the history of the British and you on here embracing them like they are kings and queens? Only an "F" in History Class produces the kinds of blogs some who got "A" in history see on here. Just like Turks and Caicos decided their right?! Stupes please. You believe this is a democracy but government acting like pure dictators. Scare tactics!! The NDP are the ones giving away most of our lands and islands to their rich white friends and other foreign nationals. Several of them now own at least two islands and other lands. complete selfishness, total disregard for the people,.No matter how I search my mind I can't find no good reason for the boycott, but selfishness, disregard, no wisdom, no leadership skills and a bad example...So sad. The leader of the Opposition was there so what is the problem. He and the Queen's reps hand in gloves so let the light shine on Mr Opposition leader whose leadership was granted to him by the Queen's rep. per his request. Elected folks have no business in that stroomoo. Members of Parliament are the constitutional representatives of the people. I will be engaged, but I will not shy away from acting where the values of fairness, security, and good governance. New Governor quote. Hope he look into Immigration and labour and the nonsense going on in there where born here children are being denied entry. Originally I wanted to say JUST CHILDISH. Isn't the speaker suppose to be neutral and basically keep order in the house, or am I missing something here? By the way, that childish, no disrespect to our children. She is going by the book and there is no more fairness than following the written rules. they want Independence. They must first display the ability to use good judgement. Independence, really, England goes and so goes the one of the Pillars, goes the dollar, Crime really goes up hurts the other Pillars and since the BVI HAS SO MUCH MINERAL RESOURCES it will be OK. Please don't be stupid Independence for BVI will not be Good ask any Expert and see! They don't want independence. They want the Money. Full access to the General Fund. No one has seen the budget or an audit of accounts in years, the public wouldn't miss it if they never see it. Independence will be the end of BVI as a high end tourist destination. Slippery slope the govt has us on now. I expected more from Mitch. Total disappointment especially being a man of God. Bald always goes on vacation with his family around this time even before he was in office, his vacation would have been planned from last year. Don't worry folks, they will show up when they are subpoenaed to testify on misspending, good governance and transparency. Majority ruled. They were voting in by the people of the Virgin Islands (uk), so why complain now? I feel the government know whats about to come down on them and they are treating the governor this way because their ways are coming to an end. There's a new sheriff in town. Listen to all these house slave mentality material of the world sell out week coward . We were never free. Listen to us. This is why BVI not ready to go independent... Leaders are childish!!!! You don't have to agree with someone to show them the respect you expect t from them. Besides, strategically a poor move to not make an appearance. Now they know where you stand from the get go. They should call a snap election now see where it would take them. If we love country and people we would act different. All can't have a reason on that specific day. With BREXIT nobody going independent.. to beneficial to England. The members that did not showed up, that is their priviledge. But on the other hand it is disrespectful. I order for this country to go independant. There must be accountability and good governance. THe government has to decide with the people of the territory, that we should consider being independant. I hope the with time that all Ministers should respect and work together with the new governor. It is because of ill- mentality, why we balck people does nto get any where in life. Cut Tortola off from spending the American Currency. Let them start using the British pound. @First Thing, I agree with you. The US should sanction the BVI for a while and make them use the British Pound. Seriously??? Are these guys in high school.. How childish and pathetic. Not to mention incredibly rude! What a disgrace. Hey someone please help me probably i am dumb so what is the moral behind the Speaker's move to not to allow the Governor to be sworn in in the space where the HOA convenes? How would it help the B.V.I.S? When the new Governor hosts his Christmas parties and other celebrations, would she and the others who were not there be attend if invited? After all isn't the Governor's House his house while he holds the post? I will line up with my camera to see them. Yes they would attend because they have no shame. I was very disappointed when I learnt that so many of our elected official and the speaker were absent from the swearing in ceremony of the new governor. This is a bad reflection on the leader of government; Hon. Dr. D. Orlando Smith. Being as it is on such an auspicious occasion, he should have ensure all of his members present. The swearing in ceremony must have been discussed at some time and it was not something to happen abruptly. All the members were suppose to make arrangement for their presence. Except there was a war fighting in the battle field and the security of the nation was at threaten, all soldiers were suppose to be present. This is a gross disrespect for the British Monarchy and it will not go well. Whether we like it or not, so long as the Union Jack is hoist in the territory, the British government's representative will be here. The talk of independence for the territory is a view of the members of the House of Assembly and not a view of the voting public. If a referendum is to be held tomorrow or in the near future to decide if we should go for independence, the government will loose badly and they will hold a snap election. The other political parties must be prepared. "It is our understanding that the stand taken by some who did not attend the ceremony was to send a message that the VI should be thinking about independence and not holding on to vestiges of the colonial past, where an un elected civil servant in the post of Governor has more power that an elected government"
@Family, you can have all the Education but, that does not mean you have common or street sense. Eight flaying house crabs in one bucket chewing each other claws off for power. I am questioning how much bloggers read the Constitution before they start blogging without proof and evidence of what they opine. No one was refusing the Governor to be sworn in at the House of Assembly Building. The issue was whether the Deputy Governor could direct and command the Speaker to convene a sitting in the House of Assembly for that purpose. Therein lies the issue. That is the distinct difference. Respect that difference. Didn't the Constitution granted to the citizens and Members of the House of Assembly the fundamental rights and freedoms of expression, conscience, assembly and association? Well if that is their right and freedom and they exercised it, why are people getting upset with them? Get upset with the Constitution then. In the meantime, stop wishing for the British to deal with the Virgin Islands in a heavy-handed fashion because a Constitutional stand was taken. In the meantime, please start to do your research and start to gather facts for when the debate starts about what should be the next course of determination as a country for these Virgin Islands. Please come with sound reasoning and avoid the vain babble that is often written by so many bloggers on these news sites. Stop wishing evil for our people and the way of life that the forefathers toiled so hard for to deliver to this generation. Mine Eh; Stop it! Where were you over the last five years when your party repeatedly violated the constitution by refusing to present audited finances? Where were you when your party repeatedly violated the constitution by refusing to put out government projects to tender? And where were you when members of the HoA repeatedly refused to disclose their financial interest to the registrar Mrs. Victoreen Romney-Varlack? Some of your HoA members also try to acquire government contracts illegally without tender, fully well knowing this practice is unconstitutional. Your reading of the constitution leaves a lot to be desired and is narrow and self-serving. People like you do not care about the constitution nor this territory. You only care about your party and what you can get from them. It matters not, to you, what your party does. Please read the VI constitution. Obviously you do not understand issues. Stick to the issue at hand. It is not all over the Constitution. Them were right. Go read. Most of you are giving in to your scared nature which to me says you come from a class that should be rule and shouldn't have a voice. We have always done for ourselves! A people who are scared to fight and do for themselves are a people that will forever be rule by some one else. VIlanders have always been a prideful people that do for themselves, if you live right, live within your ability/resources and if you know what you want/have done is righteous then there is no need to fear. Make sure your govt have set up measure/laws/policies that serve the people, that give the people real power. The same way the new Governor was snubbed, they should be snubbed form anything the Governor is having. Starting with MS. Airhead petty Pumpkin who seems to think the HOA is her house. Mr.Governor they do not speak for the entire BVI. I wish to welcome you and please don't take them seriously someone them just following on another everything has a process. I bet you it don't tell you how to disrespect the people who put you there to represent them. This is absurd. Who is the Speaker of the House to decide where the Governor was to be sworn in? After reading the comments I'm convince that the people of the VI don't have the fortitude to strive towards "Self Determination" but would readily acquiesce back into the pit of slavery. The natural state of Man is to be free, to choose his own destiny, to determine for himself what course to embark upon to the best of his ability and not to be guided by some one else. We need to take a lesson from the poem "Invictus". Ronnie and Penn and their party will pay the ultimate price. It is one thing to talk the talk of independence, but are we ready to take such a gigantic leap? Most definitely not! Do we have our infrastructure in place? No. We are a long way off. Methinks our people should learn to creep before they want to rush off speedily. With the dark clouds hanging over the head of our current government, it is only prudent that they work toward harmony among our people, toward good governance, and toward getting their ship in order. Right now it is seriously off the coastline, and if they don't watch out, it will end up on the rocks. the bvi will never be better under these corrupt people in power!! Wicked people in power!! Check airlines for what? There they go again. The Governor came here to hit us with a big stick. The mentality of some of these bloggers. They do not know who they are as a people and they clearly do not know their past. Are you going to repeat the negative past again? Get out of the way, buddy, you too dunsey. When Tola go independent, wha currency we going use, EC?? When the UK BVIexit us, what currency will we use? We will find one. That is the least of the worries, but please do not let the British dictate your future. You going piss in your clothes all day long. History 101. So long as we continue to treat white collar crime as a tightly controlled "privilege", rather than a crime politicians with few exceptions, will continue to steal and there will be massive corruption.